As you are no doubt sick of reading, Time Spiral block is done with and we are in limbo until the release of Lorwyn. Unless you are one of the number of FNM players, in which case Standard is well and truly alive for whole ‘nother month. The deck was put together from a combination of inspirations and conversations (check it out – three words of four syllables in one sentence! Booyah!). Firstly, after writing my previous article I felt an overwhelming urge to put my money where my mouth was and use "the most powerful land in standard" in a deck. I was also intrigued, and aroused, to see if the Life from the Loam and Seismic Assault combo could succeed outside of Extended. The third source of inspiration was a conversation with fellow Sheffield Magic player Seb Parker a couple of weeks ago. 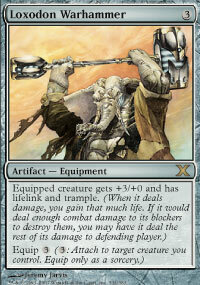 Seb had also been looking into the Assault deck, and made good use of the budget player's Tarmogoyf; Vinelasher Kudzu. The Kudzu has amazing synergy with Terramorphic Expanse, and seemed like a great creature to play alongside the 'Goyf and Troll Ascetic. This is the first draft of the deck, which I played in the Thursday GPT at M-Fest. The plan is to begin by playing out solid creatures that your opponent must deal with (Troll Ascetic, Vinelasher Kudzu) using the removal to blow away any opposing blockers. If the creature rush stalls, the Assault-Loam combo is there to fall back on for the last few points. It is slow compared to the dedicated Gruul Aggro deck, playing more of an aggro-control game. Of course, sometimes you just get a crazy draw and can do all 20 from Seismic Assault. This makes the deck unpredictable to deal with and will keep your opponent on the back foot. The Crucible of Worlds plays a dual role in the deck. Primarily it allows you to recur Horizon Canopy each turn, generating massive card advantage at the expense of mana development. It also allows you to abuse Terramorphic Expanse; particularly effective with Kudzu in play, since you can give it 2 +1/+1 counters a turn. The sideboard I took was pretty unfocused - Standard was all over the place before the rotations, and there were any number of decks I could face. I didn't expect storm to show up in large numbers after losing some key cards. I also thought that the wide array of hate would make the Dredge deck too risky a prospect to play. I was expecting some form of beat down to be popular. Either Gruul or Rakdos seemed to be the best of these kinds of deck. I packed an extra Warhammer for these matches, since I wanted to make sure all my creatures could trade with theirs, and convince them to aim their burn spells at my guys rather than my face! Dead // Gone would take care of their threats - killing things like Dark Confidant, or bouncing Spectral Force, Greater Gargadon and the like. Control decks were less of a worry, since my creatures should cause loads of trouble for them. I included Boom // Bust and a third copy of Crucible of Worlds for this match so I could attack their mana base. Note that Bust works very well with Terramorphic Expanse and Horizon Canopy, since you can sacrifice your land in response to avoid card disadvantage. The last five cards I wasn't really sure about. Since I had mountains in the deck I opted for the default Demonfire, with two copies of Beacon of Destruction to help deal with any Angel of Despair or Tombstalkers that may show up. 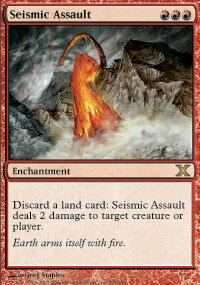 I want to stop briefly to point out the art for Seismic Assault. That is a fist made of lava punching a bird. Awesome. I'll share a brief run down of my performance at the tournament. Dredge not quite hated out then - Stuart Wright played through the fear, with the rational that dredge is just "the strongest deck in the format". Fair enough then. I lost this round 2-0 and realised straight away that the deck needed Mogg Fanatic. At this point I hadn’t seen the results of the Australian nationals, so this deck was a mystery to me as we began. In the first game he kept a no land hand with two Lotus Bloom, and went off on turn four with Grapeshot and Pyromancer's Swath. In the second I was beating him down with an army of massive creatures, but was unable to quite finish him off. He had some very fortunate draws; each time I was about to break through he managed to draw Empty the Warrens to create more blockers. Eventually he went off with Grapeshot for the win. This deck used Mishra to get loads of signets and Serrated Arrows into play, with March of the Machines and Korlash as the win conditions. Not much exciting happened here; I beat him in a very drawn out first game, while the second went to time. In game one I got a fast start and overpower him with my larger creatures. In the second game I take a mulligan to 5, but lose a longer game that sees him gain 14 life from two copies of Tendrils. In the decider I have a great draw, with a turn 2 Kudzu followed by Terramorphic Expanse on turns 3 and 4. Coupled with a Troll it delivered a turn 6 win. I won in two games, the first made slightly longer by the fact that I completely forgot that Scryb Ranger has Protection from Blue! The second game was won on the back of a Troll, holding between zero and two hammers, depending on how many bounce spells he had that turn. Having recovered from two matches down, a win in the final round would get me into the prizes. Game one was over quickly with a double Kudzu draw. I then lost the next two games, failing to draw a single Troll Ascetic or Scryb Ranger (both of which are near impossible for the deck to deal with) in either match. After 6 rounds I had gone 3-3. With a completely untuned deck against a decent level of competition that isn't too bad a result. Firstly, the Skyshroud Rangers are not worth the space in the deck. The ability just isn't that useful at sorcery speed, and they have an obvious replacement at the one-drop spot in Mogg Fanatic. Demonfire is another card that can go. When playing this deck it naturally wants to get up to five lands in play, at which point you are usually in a position to start recurring Horizon Canopy and stop playing more land. Loxodon Warhammer performed far better than I had been hoping, providing both evasion and life gain. Yes, that does say Cockatrice. I have been played around with the sideboard a fair bit before arriving at this list. At various points I have tried Mystic Enforcer (with a single Plains in the main deck to support it), Evangelize, Quagnoth, Pyroclasm, Char and others. I like the current list for my local meta game. Gone is awesome against Greater Gargadon, which is showing up everywhere at the moment. Against the Rakdos and Gruul decks you will usually take the control stance after sideboard, removing Scryb Ranger and a Warhammer. Both halves are great against control decks. If you get the change to bust a bounce land early you can really wreck their development. Crucible of Worlds means that playing Bust is a sure fire way to win the game. For Teferi's Moat and Coalition Relic, as well as opposing hammers. Also randomly useful against rogue decks sporting such luminaries as Mana Barbs, Searing Meditation, Cloud Key, Akroma’s Memorial etc. This is another card that can be useful against the aggro decks, since Rough will take out Dark Confidant and Giant Solifuge. Tumble is a nice option if you come up against a Dragon deck, although I've not needed it so far. Hurrah for terrible sideboard tech! I have to admit that there is one creature that this deck is utterly incapable of dealing with... Silhana Ledgewalker! I have been utterly wrecked by this little elf wearing a Moldervine Cloak, or even worse Blanchwoood Armor. 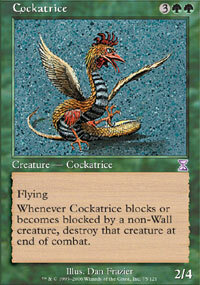 Cockatrice also happens to kill Akroma and Greater Gargadon should that situation arise, so it has hung on to its place so far. This is easily my favourite deck in Standard right now. It has plenty of great cards and a hefty amount of ‘reach’ past the early creatures. It definitely improves with experience playing it, and learning when to press on with the creature assault and when to switch to the Seismic Assault kill is key. Some tips on playing: always use Terramorphic Expanse to get up to triple red as soon as you can. Even if you don’t have Seismic Assault in hand, it is easy to sand bag a couple of lands once you hit five in play and turn it into a killer top deck. Go all out aggro with your creatures in game one. You have enough burn to finish the job, and don’t care about getting hit back – especially if you find a Warhammer. With luck you can get the job done without revealing the Assault-Loam engine, and catch your opponent cold after sideboarding. Against Gruul and Rakdos aggro decks remember that you are the control player. They have more burn than you and faster creatures. Look to trade with their creatures if you can, since this deck has far more card drawing power to dominate the mid to late game. As always, kill Dark Confidant on sight. Control decks are just a case of trying to apply as much pressure as you can. You have creatures, spells, artifacts and enchantments that are a threat to them, so make sure they have to find answers to everything to beat you. Dredge is mainly a case of trying to take out each of their enablers as they appear. Sideboard in Boom // Bust, Dead // Gone and Rough // Tumble for Scryb Ranger, Loxodon Warhammer and 3 Vinelasher Kudzu. The plan is still to take out the enablers, but Gone gives you an answer to reanimated Trolls. You also want to hit their land with Boom or Bust and force them to use their draw phase to find replacements. 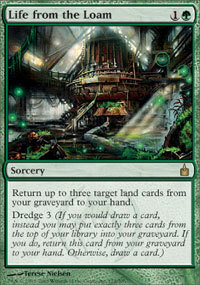 Any time you can get a dredge player drawing from their library you are heading in a winning direction. Other combo decks are a matter of playing intelligently to maximise the damage you do to them. Good luck if you try out this deck, and let me know how you do in the forums!